Built around 1870, the Walter-Jenschke Sunday House on Travis Street served as a weekend town home until at least 1923. Tiny houses have been a hot trend in recent years, with HGTV programs like Tiny House, Big Living touting the benefits of downsizing. But diminutive dwellings are really nothing new. 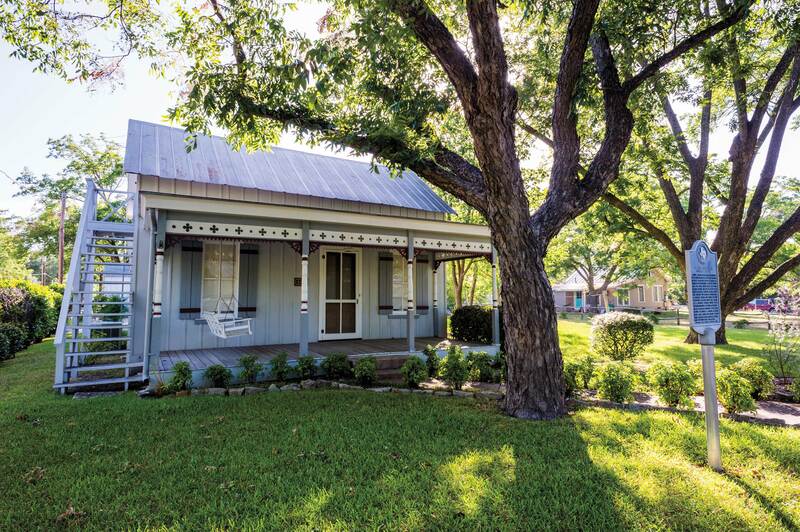 In fact, the Hill Country town of Fredericksburg is home to dozens of tiny homes dating back more than 100 years. German settlers founded Fredericksburg in 1846 in search of economic opportunity and land for farming staples like corn and raising goats and other livestock. They established homesteads in the rambling countryside and stately churches in Fredericksburg, the seat of Gillespie County. By the late 1800s, more than 1,000 German immigrants populated the area, and their influence can be seen in the many Old World-style buildings still scattered about town. But for far-flung farmers, the trek into town by horse-drawn wagons could be long and arduous. To make the most of their town trips, many country families erected small homes, called “Sunday houses,” so that they could stay overnight. Spanning 3.5 acres along West Main Street in downtown Fredericksburg, the Pioneer Museum chronicles the history of Sunday houses (among other vernacular architecture) and serves as an ideal launching point for a self-guided walking tour of the tiny historic homes, most of them within a few blocks of one another. For a broader overview, the museum offers a guided historical and architectural walking tour of the town on select Wednesday evenings. Evelyn Weinheimer, archivist at the Pioneer Museum, says Sunday houses represent a past era of Fredericksburg culture more than an architectural style. “Coming to town was a big deal,” she says. “The roads weren’t good, and the buggies were slow.” Rural residents used their Sunday houses for trips into Fredericksburg to take care of shopping and business, perhaps go to a dance or other social gathering, and attend church services the next morning. Among the historic buildings at the museum, the 1904 Weber House is a prime example of a traditional Sunday house. For the most part, weekend homes such as this one were built between the 1890s and 1920s and consisted of one or two rooms with a half-story above used as sleeping quarters. Their architectural styles varied: Some, like the Weber House, were simple wood-frame constructions; others were made from limestone. Some were bare of ornamentation; others featured turned columns and gingerbread trim. 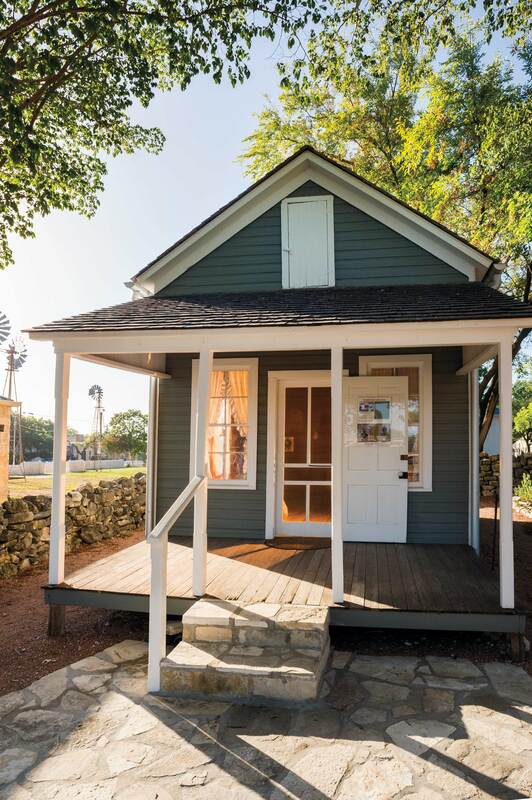 Rural residents built Sunday houses, like the 1904 Weber House on display at the Pioneer Museum, for places to stay while visiting Fredericksburg. At only 16 feet by 20 feet, the Weber House looks like an oversized dollhouse. The attic sleeping loft (not accessible to the public) was once reached by climbing a ladder to open a small door at the back of the house. Its cozy interior still has its original beaded-board walls and is filled with trappings of the time: a simple cot, a table and chairs, and a wood-burning stove. Some of the furnishings and dishes on display belonged to the Weber family, who were among Fredericksburg’s earliest pioneers. August Weber, who lived on a farm 7 miles from town—along with his wife, Alwine, and two children—built this Sunday house for his family to be close to Zion Lutheran Church. (Alwine’s father, a local baker, had given them the land.) 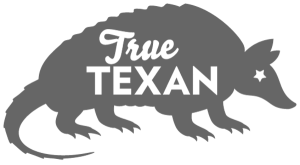 In 1972, a daughter-in-law donated the building to the Gillespie County Historical Society, which moved it four blocks east to its current spot at the museum. 325 W. Main St. in Fredericksburg Open Mon-Sat 10 a.m.-5 p.m. Guided Historical and Architectural Walking Tours are held select Wednesday evenings; $15 for adults, $10 for children. Nightly rates start at $89. Just across the street from the Weber House stands one of the town’s oldest surviving Sunday houses: the Gentemann House, built in 1885-86. Made of limestone, it features a front porch and bears traces of additions that were made to make the home livable year-round—a frame structure at the back encloses a kitchen, bathroom, and utility space. Friedrich and Margarethe Gentemann built the home for their weekend trips to attend St. Mary’s Catholic Church, along with their seven children, from their farm northwest of town. Today, it’s privately owned. Just around the corner on West San Antonio Street, three tiny houses sit neatly in a row, bringing to mind The Three Little Pigs. The first, a white wooden building with a covered front porch and exterior stairs, is the historic Metzger Sunday House. John Metzger Jr., one of the first children of German descent to be born in Fredericksburg, built it in 1909. Metzger had initially lived in a small rock house in town, but after the death of his first wife he moved to a 475-acre farm on Bullard Creek. He eventually constructed the little Sunday house in order to attend services at St. Mary’s with his second wife, Mathilda, whom he had married in 1878. Over the years, the family enlarged the one-room space with the addition of a bathroom and a kitchen/dining space in back. Descendants of the Metzgers still own the property and have decked out the interior with antique furnishings. Today, the house once again offers a place for short overnight stays: Those looking to try out small-scale living can make reservations through the local management company Gästehaus Schmidt at $89 to $125 per night. The front room serves as both the bedroom and living room, but what guests lack in space, they gain in charm. 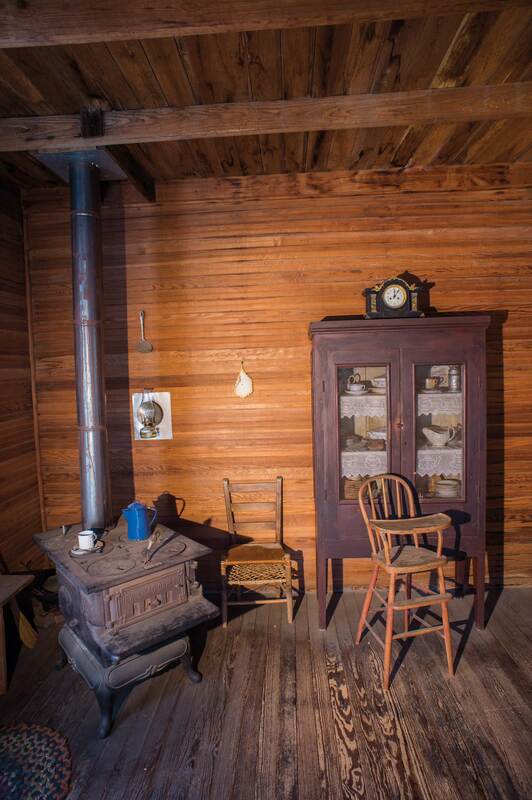 The Pioneer Museum has outfitted the Weber House with period furnishings. Just north of West Main Street, historical markers identify several other privately owned Sunday houses. The Victorian-style Vogel House on Austin Street catches the eye with its pressed-tin exterior, jigsaw-cut trim, and turned posts painted red, white, and blue. At first glance, this home might seem too large to qualify as a Sunday house, but according to Eileen Whited, who leads walking tours for the Pioneer Museum, “It’s not the size of the house but its use that makes it a Sunday house.” The left half of the building was the original one-room dwelling erected around the turn of the century, Whited says. A widow named Elise Vogel used the building as a Sunday house until 1907, when the right half was added for year-round habitation, along with tin cladding embossed to resemble the texture of limestone. In the 1920s, automobiles began to replace buggies as the transportation of choice. With the convenience of driving into town, farmers relied decreasingly on weekend homes, although some families continued to use them into the mid-century. Subsequently, Fredericksburg residents adapted the tiny homes for other purposes, either expanding them into regular domiciles or renting them out as unusual accommodations. As uncluttered retreats from the hustle and bustle of contemporary times, these tiny homes not only provide a glimpse of how life once was, but also how it could be. What’s old is new again.